COLUMBIA - Haby Naya grew up in Chad, Africa. She spent lots of her free time braiding hair, anyone’s hair - baby dolls’, her sister’s, the girls’ in the neighborhood. In 2004, she moved to America on a student visa to get a master’s degree in education at MU. Naya said her dad encouraged her to get a master’s, but it was never the path she saw for herself. “I told him, ‘I did what you want, but now I’m going to do what I want,’” Naya said. Naya went to cosmetology school at Cosmetology Concept, now known as Paul Mitchell, in Columbia. Since the beginning, Naya said her goal is to own her own big salon in her home. After 13 years spent in America and $21,000 saved, she finally fulfilled her dream. She said hair braiding is her passion and always will be. Before her new location, Naya ran Haby Hair Braiding in a space one-third of what she has now. Naya says her new salon will offer things she didn’t have the room to offer before, like a hair washing station for deep conditioning treatments. She says although she lives in America, Africa is still near to her heart and she wants to show that in her salon. Naya’s fellow cosmetologist and long time friend, Brittney Ellis, said Naya is one of the best in the business. “She’s actually from Africa, so she knows how to do braids other hair braiders can’t,” Ellis said. Naya came to America fluent in four languages, but not English. Even after an intensive English program when she came to America, the language barrier still was prevalent in her schooling. Her teacher, Bonnie Roberts, said she’s not surprised Naya overcame her challenge. Roberts also provided Naya with guidance for opening her new salon. “I think you feel such a sense of satisfaction when someone reaches their goal,” Roberts said. And even though she has achieved so much, Naya isn't done. She only has nine credits left to earn her Masters in Business and she plans on going back to school next year. A little further out, she said when she gets the finances she wants to host interns in her salon to help teach others how to braid. 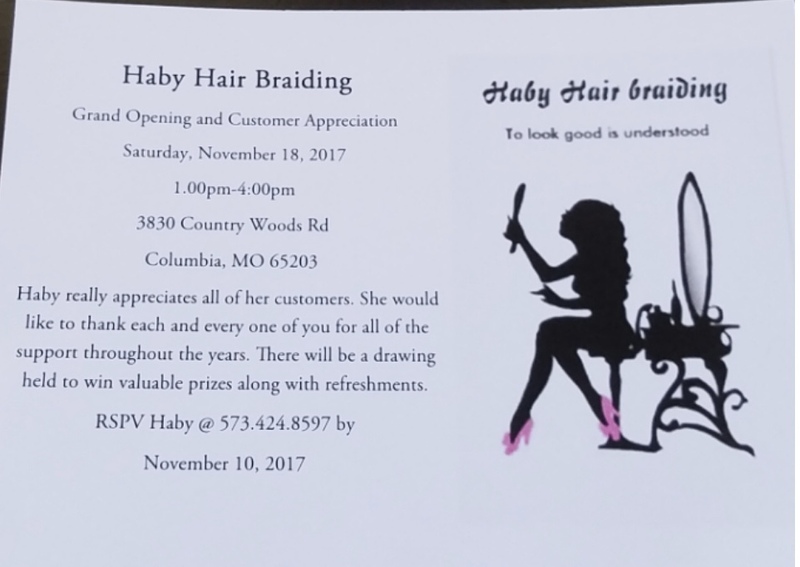 Her grand opening is Saturday, November 18.